We’d love your help. Let us know what’s wrong with this preview of The Progeny Assassin by P.A. Wikoff. Lara is a young and deadly feathered-folk who protects what is left of a dying land. Burnt-out trees and ashen soil are all that remain of the forgotten forest. After years of becoming complacent, Lara seeks anything to break the routine. And when her master goes missing, she finds the adventure she's been longing for, only it isn't at all as she expected. This the second Lara is a young and deadly feathered-folk who protects what is left of a dying land. Burnt-out trees and ashen soil are all that remain of the forgotten forest. After years of becoming complacent, Lara seeks anything to break the routine. And when her master goes missing, she finds the adventure she's been longing for, only it isn't at all as she expected. This the second story in The Tarnished Lands series. It can be read without reading the first book, "The Harrowed Half-Breed." To ask other readers questions about The Progeny Assassin, please sign up. Should I only read this after the first one? The Progeny Assassin is A Tarnished Lands Story and the second book in the Forgotten Woods Series By P.A Wikoff. This is another interesting and original fantasy full of action, adventure, drama, unique creatures/beings, magic, some violence, drama, despair, discoveries, darkness & light, renewal, hope, and much more. As with the first book, this story has a bit of dark tone to it, giving it the feel of an epic D & D story/game. But mostly this it is a story of revelations & self-discovery and how Lara finds her true purpose in the Tarnished Lands. This is my favourite of the series, so far. I was hooked right from the beginning and didn’t put it down until I’d read every word! As with the first book, this is vividly descriptive, and intricately detailed- which brings this fantastical tale and world into ‘being’. A worthy addition to this wonderful series. So, if you love swords and sorcery, D & D, original and intriguing fantasy, and quirky/unique characters- then this book should be on your TBR. Bring on Book #3, “The Mad Wizard”! A great read about growing up. Lara is a reckless and daring young girl. As a feathered folk, she seeks to protect her dying forest from invaders but never takes it seriously. When her master suddenly goes missing, Lara sets out to find her, thinking it will be like one of the great quest narratives she loves to read. But the world is full of surprises and dangers Lara never knew. existed. Can she survive it all and find her master? A great read. Well developed plot with twists and turns that I j A great read about growing up. Lara is a reckless and daring young girl. As a feathered folk, she seeks to protect her dying forest from invaders but never takes it seriously. When her master suddenly goes missing, Lara sets out to find her, thinking it will be like one of the great quest narratives she loves to read. But the world is full of surprises and dangers Lara never knew. existed. Can she survive it all and find her master? A great read. Well developed plot with twists and turns that I just couldn't put down. Well developed characters like Lara as bold and daring but vulnerable and childlike underneath or the master as the stern mentor figure. I loved the visual detail throughout the novel with the sense of destruction with the burnt out trees and dead grass and ash with memories of what was there like the pink lake or the fresh wind for a sense of loss. And the wonderful magical sense of the mist and the moon later on for Lara as a source of unexpected happiness. THE PROGENY ASSASSIN is book two in the "Forgotten Woods" series. While I think it MIGHT be able to be read as a stand-alone, I suggest reading it in order because the writing is amazing. This is one of those stories that transported me to a place that I never could have imagined. It is so creatively written, that I was able to watch a movie in my head as I was reading. It is also one of those stories that I read really fast and breathlessly, much like the action taking place. In addition to LOVIN THE PROGENY ASSASSIN is book two in the "Forgotten Woods" series. While I think it MIGHT be able to be read as a stand-alone, I suggest reading it in order because the writing is amazing. In addition to LOVING this story, I have also learned some new cuss words ("...you gross piece of fundle snop!"). I recommend this story and this series to young and old alike. The Progeny Assassin: A Tarnished Lands Story (Forgotten Woods Book 2) by P.A. Wikoff was a fast moving,engaging, intrilling read that had me hooked from start to finish. Not my first read by this author or in this series, but even though this is book two, it reads as a standalone. So if you haven't read that first book, no worries, but I do suggest reading it as it does set the stage for this dark, deadly world. That and, it's a pretty amazing book in its own right. This book takes place in ano The Progeny Assassin: A Tarnished Lands Story (Forgotten Woods Book 2) by P.A. Wikoff was a fast moving,engaging, intrilling read that had me hooked from start to finish. This book takes place in another part of the Tarnished lands. Following our MC Lara, a deadly feathered-folk warrior and, her journey towards finding her true place in that hellish world. I must say right away I liked Lara. There was just something.. there about her. I can't explain it, because I'll get too much into her, and I don't want to spoil anything. Let just say, she's what all female protagonist should inspire to be. Rich with the dark tones that were present in that first book, the writing is just as sinister and the detail just as darkly picturesque, painting the horror that is the Tarnished Lands. This original thriller is on a different level of good, and I'm stressing to you, that you need this book in your lives. Not just this book, but the first as well. With that said I'm going to leave you with my super high recommendation and my stamp of approval. I give The Progeny Assassin: A Tarnished Lands Story (Forgotten Woods Book 2) by P.A. Wikoff, 4 stars. Lara is so tired of her master. Nothing she ever does is good enough. Sometimes it feels like she just can't take it any more. But her and her master are the only feathered folks left. Then one day, her master heads out to clean up one of Lara's "messes". This is unprecedented. Master never leaves the house. To make matters worse, she doesn't come back. Lara finally decides to go out and look fo I give The Progeny Assassin: A Tarnished Lands Story (Forgotten Woods Book 2) by P.A. Wikoff, 4 stars. Lara is so tired of her master. Nothing she ever does is good enough. Sometimes it feels like she just can't take it any more. But her and her master are the only feathered folks left. Then one day, her master heads out to clean up one of Lara's "messes". This is unprecedented. Master never leaves the house. To make matters worse, she doesn't come back. Lara finally decides to go out and look for her. She is smart and old enough, she can take care of herself. Leaving with only a weapon she created herself, the things her master has taught her, and her wild imagination, she sets out on a journey unlike one she could ever have imagined. This is a great young adult fantasy book. Although not human, Lara resonates with most teens. They think they are ready for it all, but they really aren't. Not that they will admit it. The story itself is great. The things met along the way, the things she learns, will enrich her knowledge. And the detail you come to expect in high fantasy is here in spades. The story The Progeny Assassin: A Tarnished Lands Story (Forgotten Woods Book 2) by P.A. Wikoff is a wonderful fantasy book that I loved reading. It is a story that has action and adventure. I enjoyed reading about the character of Lara. She is a feathered-folk who finds herself on a journey. She is both interesting and intriguing. Lara is a character that has questions and soon finds that the journey she is taking is not what she expected. She faces conflicts. There are times of danger and discovery. There is an amazing job of world building. The story is detail oriented and I felt like I was right there with Lara on her journey, seeing and feeling what she did. Read this story to find out all about what happens on Lara’s journey. This is a book that once I started reading hooked me in and I found myself lost in the story. I enjoyed this book just as much as the first one. I look forward to reading the next story in the series. The Progeny Assassin is the second book of PA Wikoff’s Forgotten Woods series. While I don’t necessarily think you need to read the first book in the series to follow along with this book’s storyline, I enjoyed having read the first book prior. The Progeny Assassin is one of those books that transports you to another time and place until the story is over. The description in PA Wikoff’s writing is impressive, it’s dark and captivating all at once. The characters in this book are as unique and exciting as the twisting storyline too! I’ve always considered myself to be someone that wasn’t a fan of fantasy type reads but as of late I’ve really been exploring the genre more. This book and really the Forgotten Woods series has truly captured my attention. I look forward to reading more from PA Wikoff. This is the second book that I have read by this author an again I really enjoyed it. It’s not my favourite genre but I have really enjoyed finding a new genre to enjoy and I think P.A. Wikoff is a fantastic author and he has a great writing style which keeps my interest throughout. I really liked the characters and the detail in which the author had used enabled me to fully envisage what I was reading. Lara is a really interesting character and I really enjoyed following her story. There are some great twists and turns in the story and it is definitely full of action and fantasy. I am definitely looking forward to reading more from this author again in the future. This is the second book in the series and I have to admit that I was just as drawn in to this one as I was the first. I quite like the otherworldly tone to the book. The author has quite a unique world and style in which the reader is drawn into the world like you are there as it the drama unfolds. 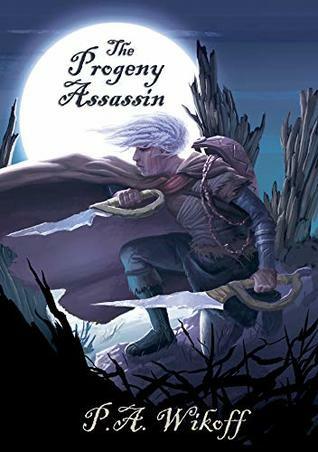 The Progeny Assassin: A Tarnished Lands Story ( Forgotten Woods Book2) By P.A.Wikoff is a wonderfully written fantasy book that can be read as a standalone but I suggest reading the first book in this series as well.Get ready for a very Magical Adventure that will have you hooked from the beginning till the end. Lara’s been protecting what's left of the dying land,but what happens when her Master goes missing and she gets an unexpected adventure.Find out what happens next, I highly recommend reading this book.its definitely a must read. I look forward to reading more from this Author. The Progeny Assassin was n interesting read. The author wrote about Lara finding her true potential. The lies and betrayal felt from many characters. I didn’t enjoy the length of the story. It was a lot to read. With that being said I was intrigued by the main character and how her mind worked. It was pure instincts and a little logic. The characters were well developed. There was too much dialogue in every chapter. It was information overload. I did like the direction the author took there wasn’t some great love to make her see the right path. She is on a journey to find answers and her true self. The Progeny Assassin: A Tarnished Lands Story by P.A. Wikoff is the second book in the Forgotten Woods series. Though each book can be read as a standalone I would suggest reading Book 1, The Harrowed Half-Breed, first. Just like book 1 this book is incredibly detailed, so detailed in fact that it felt as if I was right beside Lara during her journey of self-discovery. This storyline is dark, twisted, captivating, entertaining and action-packed. I was captivated from the very beginning until the end. If you’re looking for a one of a kind fantasy read look no further! The Progeny Assassin: A Tarnished Lands story by P.A. Wikoff is the second book in the Forgotten Lands series. This book can be read separate to the first although in my opinion you will be missing out. It had been a while since I have read book 1 and I loved jumping back into the Tarnished Lands world. This author has a way of painting a picture so that it is so easy to imagine the characters and what is happening. This particular book is fast paced and intense. It feels like you are taken on a The Progeny Assassin: A Tarnished Lands story by P.A. Wikoff is the second book in the Forgotten Lands series. This book can be read separate to the first although in my opinion you will be missing out. This particular book is fast paced and intense. It feels like you are taken on a wild journey, right alongside Lara. It is adventurous and exciting and an all round enjoyable read. This book can be read as a standalone but I highly suggest reading the first book, a must read series! I love how this author takes me on a magical adventure that is creative and engaging. The characters are creative and they pulled me into their magical world and made me feel as if I was right there with them. Lara has been protecting what is left of the dying land. What will happen when her master turns up missing and she gets the adventure that she wasn’t expecting? A must read! The Progeny Assassin: A Tarnished Lands Story (Forgotten Woods Book 2) by P.A. Wikoff is the second book in the series which follows on from the Harrowed Half-Breed. It can be read as a standalone but it will give you more background if you read the first one. P.A’s easy writing paints vivid pictures of the world in which this story is told and of the characters who have not lead an easy life. The eeriness and darkness of the story keeps you intrigued and the pages turning. The Progeny Assassin: A Tarnished Lands Story (Forgotten Woods Book 2) by P.A. Wikoff i​s the second book in the series which follows on from the Harrowed Half-Breed. It can be read as a standalone but it will give you more background if you read the first one. P.A’s easy writing paints vivid pictures of the world in which this story is told and of the characters who have not lead an easy life. The eeriness and darkness of the story keeps you intrigued and the pages turning. I jumped into this book quickly. What a fantastic new world the author has created. Complex and detailed, this dystopian fantasy felt realistic and relatable. The author gives the main character a great voice. The universe created for these characters is one I look forward to visiting again very soon. The story was very hard for me to get Into. There is so much narrative. I struggled to focus on the story. I found myself reading through a haze at times. It does get more exciting about half way. For some reason I really couldn’t get into Lara’s story. I didn’t even realize she is the assassin until she keeps killing. Her Master disappears and Lara goes on a quest for find her. On her way she runs into different feathered folk and humans. Some she likes and others she doesn’t. She learns a few things about herself as the story moves forward. The character Lara actually seemed like a good character. I could see her growth as the story went on. This is the second in the series. I feel it could be read as a stand alone but it might be more enjoyable if read in series order.